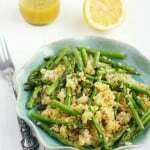 Home » Side Dish » Asparagus Quinoa Salad with Lemon Mustard Vinaigrette. 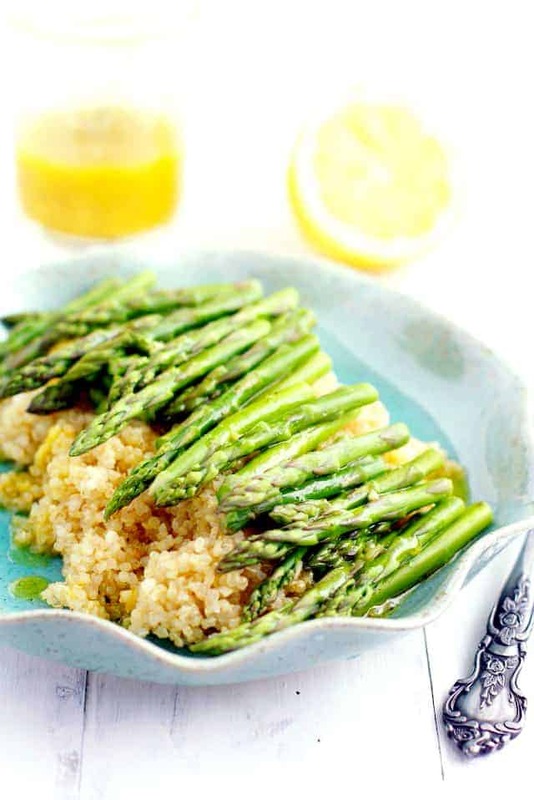 Fresh and healthy asparagus is paired with quinoa and a tangy lemon mustard vinaigrette dressing. This asparagus quinoa salad is a wonderful side dish for spring and summer. It’s spring!! We made it! We made it through February. And now we are getting close to spring, and warmer temperatures, and NO SNOW. (I hope). 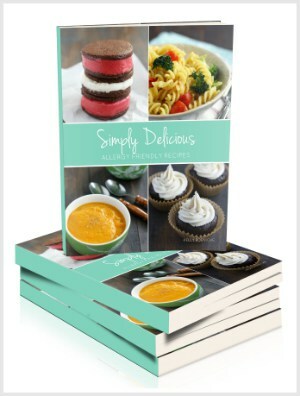 With the change of seasons, it’s time for some seasonal recipes. I love seeing all the asparagus in the grocery store. It’s one of my favorite vegetables. We love asparagus roasted in the oven – it’s probably the easiest way to enjoy it. With a drizzle of olive oil, some salt, and pepper, asparagus becomes wonderfully flavorful after just a short while in the oven. I used thin asparagus for this recipe – I find that it’s the most tender. But if you have the thicker variety, that will work – just cook it for a little longer. One of my favorite ways to roast asparagus is with some nutritional yeast. This vegan cheesy roasted asparagus has made an appearance on our menu a few times already this month. 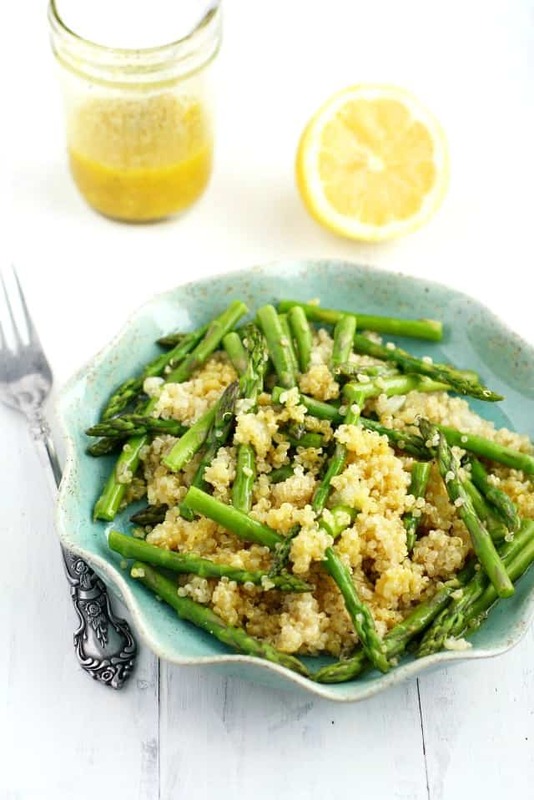 But today, I want to share this simple, fresh tasting dish – asparagus and quinoa dressed with lemon mustard vinaigrette. I love to make this asparagus quinoa salad for a quick and healthy lunch, but it’s also really nice for a side dish at dinner time. You can serve this alongside roasted chicken or fish for a light but filling meal. This is also a very fast meal to prepare. You put the quinoa on the stove, and quickly cook the asparagus in the oven and make the dressing while the asparagus cooks. Once everything is done, just toss it all together and that’s it! Very easy. How long should you roast asparagus in the oven? Depending on the thickness of the asparagus, you will want to roast it at 400 degrees for 6-12 minutes. Very thin stalks will take just a few minutes to become crisp-tender. If you want your asparagus more well done, leave it in longer. What can be used in place of mustard in this dressing? If you are allergic to mustard, you can leave it out and just add a little more lemon juice. The dressing will still be delicious! What can be used instead of quinoa? I chose quinoa because it is a gluten free grain that has some protein, but you could easily serve this roasted asparagus over rice or even gluten free pasta. It would also be delicious served with spiralized vegetables. Quinoa and Asparagus with Lemon Mustard Vinaigrette. Quinoa and asparagus is dressed with a flavorful lemon mustard vinaigrette for a delicious spring lunch. Put the quinoa, the sliced garlic, chopped onion, olive oil, and two cups of water in a medium sized pot. Bring the quinoa to a boil, then reduce the heat to low and cover. Cook for 15 minutes until the quinoa is fluffy and the little ring around the quinoa has loosened. While the quinoa is cooking, prepare the asparagus. Rinse the asparagus and remove the tough ends. 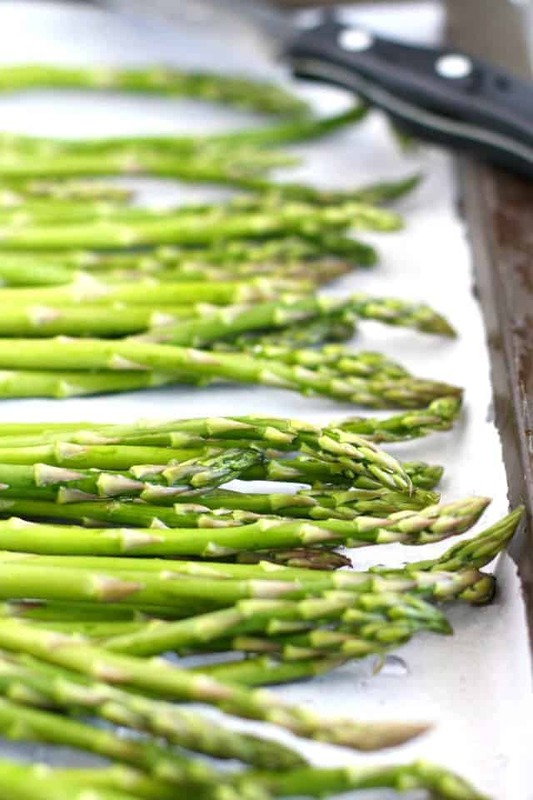 Place the asparagus on a parchment lined cookie sheet, and chop each stalk into three pieces. Drizzle the asparagus with a little bit of olive oil, and sprinkle with salt. Bake the asparagus at 400 degrees for 6-8 minutes, until bright green and crisp tender. While the asparagus cooks, prepare the dressing: combine the lemon juice, olive oil, mustard, sugar, garlic, salt, and pepper in a small jar with a lid. Shake will to mix thoroughly. Place the quinoa and asparagus in a bowl and drizzle with the dressing. Toss to coat. Have you seen any signs of spring where you are? What’s your favorite way to eat asparagus? This post was originally published in March 2015. It has been updated. « Dairy Free Potato Leek Soup. looks simple and delicious! I’m so ready for spring too. we have one last winter trip to the mountains and then I’m ready for the flowers to bloom and a new season of produce, like asparagus! we have a super short asparagus season here for some reason, so I need to eat lots while I can! Thanks, Caitlin! I know, I wish good asparagus was available for longer! It’s so tasty! I love roasted asparagus! I never would have thought to combine it with quinoa, but I cannot wait to try this! The lemon-mustard vinaigrette sounds like the perfect dressing for this dish. 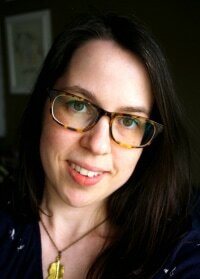 Kelly, these are my all time favourite photos you’ve taken to date- I want to eat my screen! I’m so excited for asparagus season – and spring – to be in full bloom! Your pics are making me feel all springy already! I always forget how much I love asparagus! Can’t believe it is already March! Spring will be here before we know it. This would make such a great lunch. And that lemon mustard vinaigrette sounds delicious! That vinaigrette looks to die for! I just bought some asparagus, perfect for this dish :) Pinning! this looks so delicious and healthy, Kelly! Reminds me of summer! pinned! This dish has spring written all over it! I’m so ready for spring to come. My favourite way to eat asparagus is probably grilled with lemon juice, salt, pepper, and a side of eggs. Simple but so delicious! Happy Monday! Bring on spring and all the spring veggies! 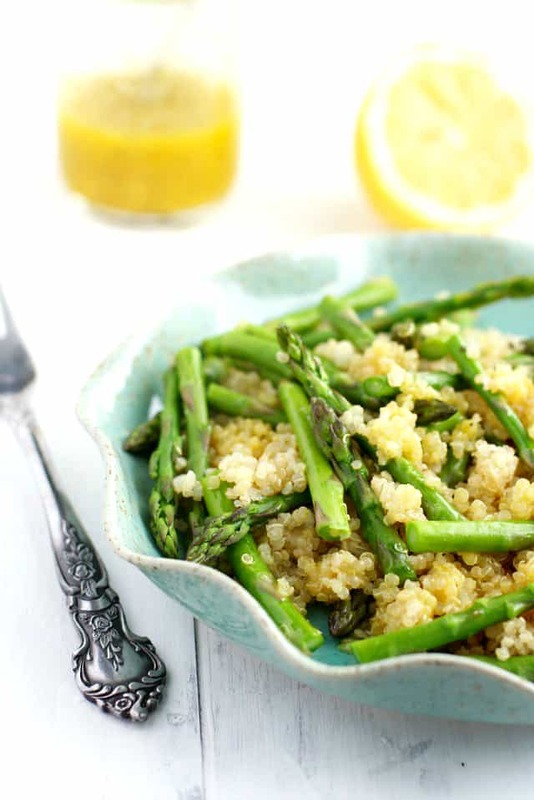 Lemony asparagus and quinoa sounds absolutely perfect. Love how simple and healthful this is! I’ve been totally on an asparagus kick lately. 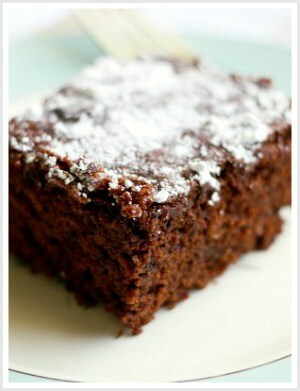 I’ll have to make this recipe this week! This salad looks gorgeous, Kelly! Just what I need to make me forget about winter. I love the asparagus and quinoa combo, delish! This is a gorgeous side dish. Recently, we’ve been eating a lot of quinoa at my house. I’m a huge fan of asparagus as well. It’s such a fresh flavor for the spring. Yay for asparagus season almost here! I am obsessing over how amazing this quinoa looks, Kelly! Totally makes me feel like spring is just around the corner! This screams spring to me! I can’t wait to make this with some grilled chicken or fish! 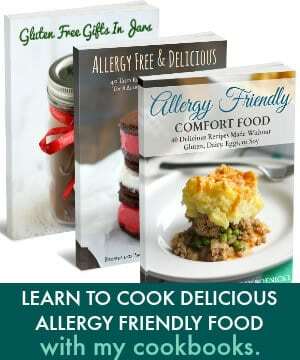 We have many food allergies and intolerances in our family, and I’m not able to remove any more food groups from our diet at this time.